Sydney – Volkswagen Australia has challenged its top-tier apprentices from its head office workshop team and dealer network to build a unique, race-bred performance concept car, with the goal of beating a lap time set by the iconic Golf GTI at Sydney's Eastern Creek raceway. Assembling at Volkswagen's Australian headquarters in Sydney on Monday 25th September, the team comprises of three high-performing apprentices from Volkswagen's 100+ strong national dealer network, and VGA's own inaugural class of workshop apprentices. Luka Popovac, National Customer Experience & Capability Manager, was pleased to be offering this unique opportunity to Volkswagen's best apprentices. "It's great to be able to give our best apprentices a chance to take on such a challenge and, in the process, give them priceless experience working with a range of technical experts from within Volkswagen and the motorsport community," Mr Popovac said. The challenge is straightforward enough: build a car to beat a previously-set lap time of 1minute, 59 seconds, completed at Sydney's Eastern Creek raceway in a standard Golf GTI. However, unbeknownst to the eager team of technicians when they arrived at Volkswagen for the build's commencement, their chosen car is two-tonnes of 4x4 Volkswagen ute. Of course, the donor car in question is Volkswagen's latest Amarok V6 Highline, with a maximum torque of 550 Nm available at less than 1,500 rpm, and 165 kW of power. Project lead, Public Relations and Brand Experience Manager, Kurt McGuiness, explained the concept behind the build. "Volkswagen has a long history of building apprentice concept cars for the annual GTI Conference at Lake Worthersee, Austria, and the cars have always been met with much excitement and fanfare. 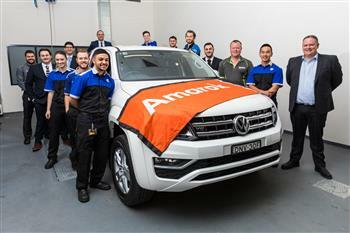 But, this is Australia – the biggest export market in the world for the Amarok – why not up the ante and have our apprentices build something that will excite and inspire Australian fans?" Mr McGuiness said. "The decision to build our own super ute was an easy one," he continued. The apprentice team is being led by a group of mentors from Volkswagen Australia's workshop team who will be on-hand to assist with the build, along with a group of generous external partners who will provide their parts and expertise throughout the week. Bilstein Suspension, Michelin, V-Sport, AP Racing and Shane's Signs have all volunteered their time, expertise and products to assist in the build. With the build now underway, the apprentice team has the remainder of the week to finish to complete their work. Once completed, the vehicle will be presented at next month's World Time Attack Challenge at Eastern Creek, where fans will be able to see the modified Amarok up-close and watch the new lap time be set. The project will feature on Volkswagen's digital and social media channels in the coming weeks, along with media test drives available following the World Time Attack Challenge. Volkswagen's Modern Apprentice Program is an industry-recognised trade qualification, and offers apprentices a range of pathways and career development opportunities from within the national dealer network and Volkswagen's head office. Those who complete their apprenticeship and go on to achieve the Master Technician qualification receive an Amarok work vehicle, provided by Volkswagen Australia. Volkswagen Australia has challenged its top-tier apprentices from its head office workshop team and dealer network to build a unique, race-bred performance concept car, with the goal of beating a lap time set by the iconic Golf GTI at Sydney's Eastern Creek raceway.